grist (n.)-brewer’s term for the assortment of grain used in a beer recipe. Looking up I read the definition printed across one of the rafters. As I finished, I heard the whistle of a train blow from the nearby railroad tracks. The noise was appropriate, a Nashville way of punctuation. Moving forward I stepped in line to sample some of the creations from one of Nashville’s newest breweries. Eyeing the menu any one of the brews listed sounded like a welcome reprieve from the humid Tennessee day. The brewery was small, but not cramped. What it lacked in space it made up for in ambiance. Industrial style chairs and stools were rounded out by rustic wooden table tops. 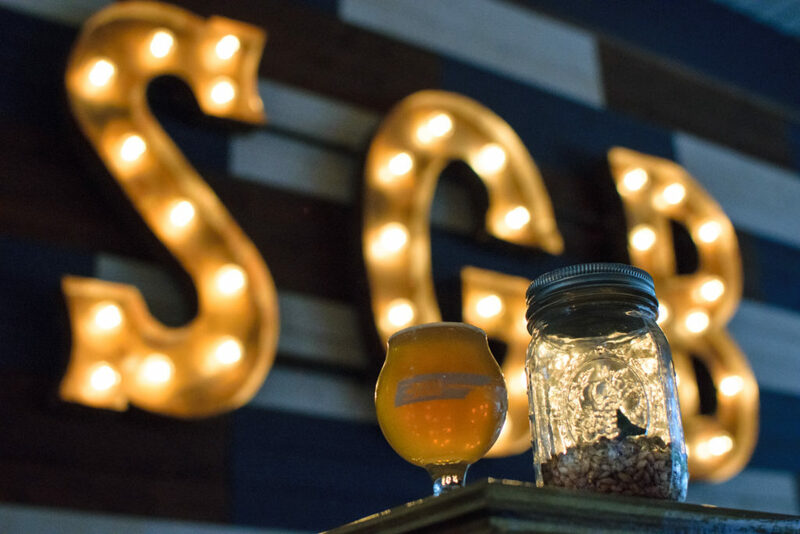 Mason jars of “grist” stood at attention on each table while the taproom’s far wall contained painted panels of reclaimed wood with the brewery’s initials lit up by warm bulbs of light. I found Jamie Lee, one of Southern Grist’s three founders manning the taps. Watching me ponder the menu he stepped in and offered some recommendations. “Velour Jumpsuit is a popular one, if you like darker beer.” he said, gazing up at the chalkboard list of brews with me. When I usually build myself a flight of tasters I normally can guess which of them I will enjoy most. Here I was at a loss, all of Southern Grist’s creations looked like potential favorites. 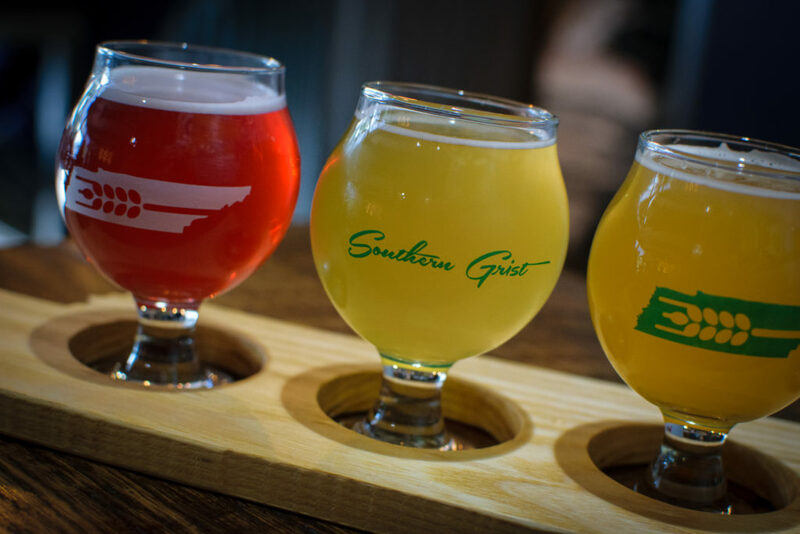 He slid the taster board, a carefully cut wooden slab complete with the Southern Grist logo in the shape of the state of Tennessee in front of me. I took my samples and sat myself facing a sunny window. Looking out into the Nashville heat, watching as another train lazily chugged by along the neighboring tracks. I hefted my first selection, Nashville Mule. A sour wheat ale, the beer was inspired by the popular Moscow Mule cocktail. Brewed with lime zest, fresh lime juice and fresh ginger it was tart and refreshing. The perfect starter to curb the humid heat. Next up I went for Jamie’s first recommendation, Velour Jumpsuit. A dark and rich porter I was first met with the familiar flavors of chocolate and vanilla bean. The finish rocked my tastebuds with the subtle and fruity addition of fresh plums. Despite being a dark and rich porter it was so well crafted and smooth I could see it easily become and all day drinkable beer. There Gose Train is a nod towards the brewery’s railway neighbor. A German style wheat ale, this thoughtful creation combine Hawaiian Black Lava Salt and freshly crushed coriander to create a slightly sour ale with just the right amount of tart kick. Last up was the much acclaimed BroConut. A feast for the palette this coconut IPA mixes an explosion of hoppy flavor with a well rounded addition of tropical fruit and roasted coconut. The result is a highly drinkable pale that isn’t too bitter and isn’t too sweet. I finished my taster and immediately wanted more. Rereading the list of beers represented the menu struck me as being so bold and unique. In a world where breweries are inundated with a twenty piece menu of all similar tasting IPAs or another where all the sour flavors begin to mingle into one Southern Grist was not afraid to be innovative and forward thinking. It was clear that they weren’t going to stick to what was safe or easy. They wanted to push the envelope and move on towards the next inspiration and flavor idea. When we talk about balance in the craft beer world we often speak of the beer’s flavor and character. Did brewer’s ratio their malts and hops appropriately? Do initial intense flavors have a smooth finish? Are any of the ingredient’s too overpowering? Does bitter give way to sweet? Fruity give way to sour? 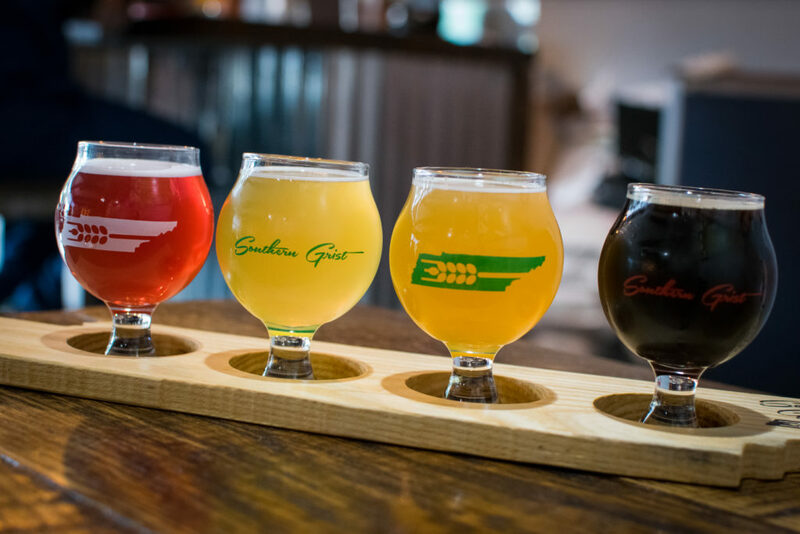 At Southern Grist Brewing Company that careful equilibrium ventures well outside of the realm of the pint glass. Everything under the brewery’s roof maintained a well calculated and precise balancing act. From the taproom’s use of space to the Tennessee style décor. The friendly and helpful demeanor of the staff to the bold and irresistible flavors poured into each glass. I couldn’t help but laugh as the door shut behind me as I walked away from the brewery. Balance continued out into the parking lot as I attempted to juggle three full take home crowlers of Southern Grist beer in my arms.